Google is the worlds leading search Engine Company and the second largest public traded entity globally. With the rising call for more accountability of institutions that deal with the general public in ensuring fair, ethical and open dealings, Google is not left behind in complying with these elements. In the recent past, there has been an uproar on the rising deceptive adverts running online, with a clear aim of confusing unsuspecting potential investors, and when they fall into the trap, they are ripped off their hard earned money. Google, being a world leader in the advertising sector through its AdWord platform has seen it necessary to exercise accountability through enabling only the certified financial advertisers on its platform. 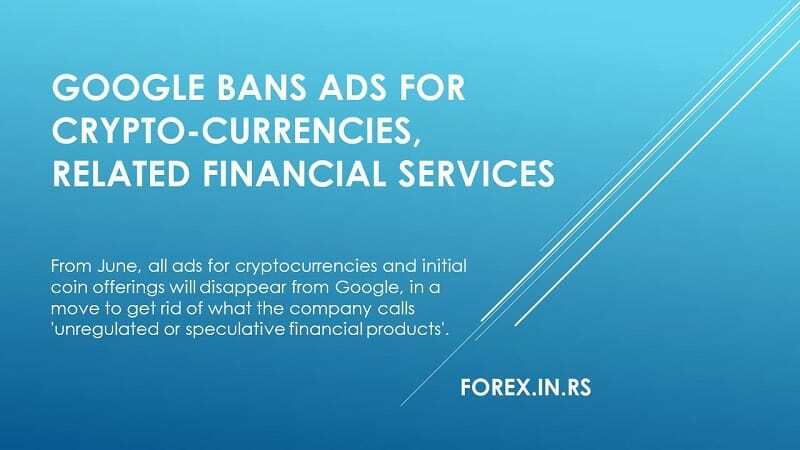 In its announcement, Google has cited ban in its platforms the advertisement relating to the initial coin offering (ICO), cryptocurrency wallets, exchanges, as well as trading advice. 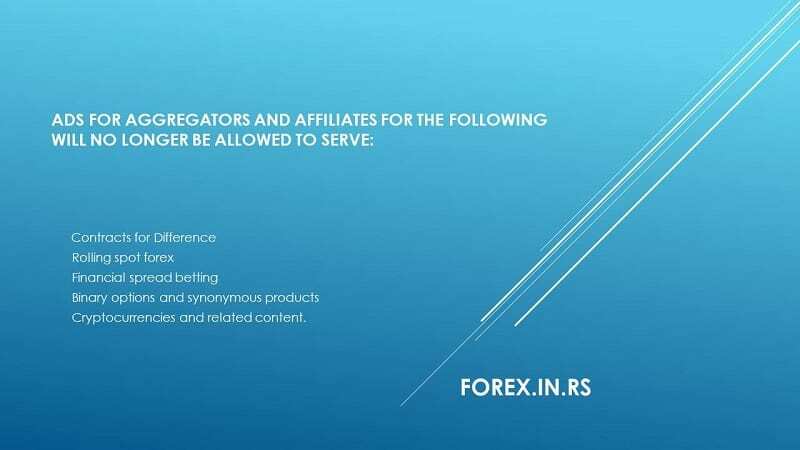 The ban also extends on other financial products such as binary options and spread betting. 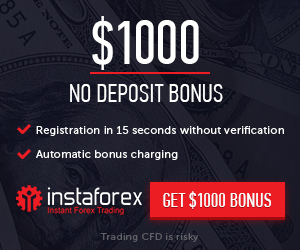 Forex advertising network will change after new Google restriction to forex trading ads. In the past google banned search terms for lot of products. 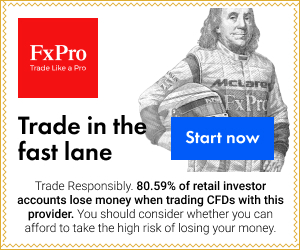 All these have to do with investor protection initiatives due to the rising fraudulent cases involving unauthorized brokers taking advantage of the high wave for quick cash in these unregulated financial products. With concerns mostly emanating from the US exchange commission concerning the ban on ICO advertisements, Google’s move is seen as a precaution to avoid a future clash with the authorities on its role in consumer data and protection. On the same note, other major players in the advertisement world such as Twitter, Facebook, Yandex have taken measures to control the same types of adverts on their sites, either by pre-approval or by total ban, due to concerns they have raised over legitimacy and also because of maintaining the overall image of these sites. 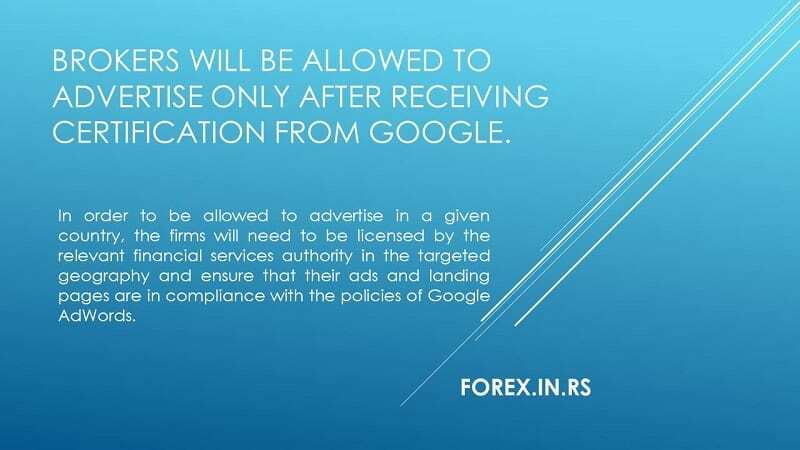 What Does Google Ban Entail – Google Bans Forex Ads ? Google’s annual earnings in financial adverts of cryptocurrency and related products have been estimated to be over $25 million. Nevertheless, Google has mounted to the pressure of axing most of these adverts due to the security of its clients, consumer protection obligation, as well as the future accountability and company image. This is largely due to fraudulent cases associated with the unregulated cryptocurrency sector and the looming security and exchange commission rules on protection of cryptocurrency investors. Canada and the U.S. have been in the forefront leading the war on ban for adverts on ICO and calling for the establishment of regulations in the online financial sector, especially cryptocurrency which in the recent past has hit the world by storm. Many investors have lost billions of dollars, mostly emanating from deceiving adverts which unsuspecting traders fall into the prey. With. This has come to the attention of the Google as a main player in the advert world. Advertisers offering Contracts for Difference, rolling spot forex, and financial spread betting will be required to be certified by Google before they can advertise through AdWords. Certification is only available in certain countries. Advertisers can request certification with Google starting April 2018 when the application form is published. 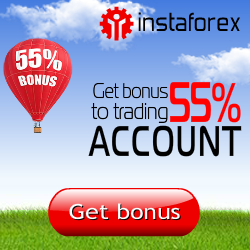 This policy will apply globally to all accounts that advertise these financial products. For more details, see About restricted financial products certification. The force on the ban will come to effect on this June 2018. Brokers in the mentioned financial areas will be undergoing a thorough scrutiny before they get approval for placing the adverts. This will eliminate unscrupulous brokers who sell unregistered securities or who pose as genuine brokers only to run away with investors’ money. After scrutiny of the broker information, Google will either reject or approve the specific broker. When approved, the broker will be issued with special certification to allow them to advertise for their product in their requested target region. Nevertheless, for one to qualify for certification by Google, the firms they represent must have acquired the necessary licensing to operate in the regions they intend their adverts to target. On the other hand, they must have conformed with various laws and regulations regarding their business in order to meet the AdWord requirements for the specific geographical area. All these processes are aimed at bringing in some sanity in the cryptocurrency sector by offering protection to the investors, especially from deceiving adverts being run by fraudulent brokers posing as legit traders. The cryptocurrency craze, especially the one witnessed by Etherium and Bitcoin has seen hundreds of other digital coins emerge, with fraudulent traders taking this advantage and floating offers in terms of advertisement for unregistered securities, which has seen either a total market collapse of the specific securities, or marginal shift in value for a short period. In this process, billions of dollars have been lost and hence the call for regularization, especially in the adverts concerning this sector as it acts as the backbone of the whole process. A good example of a fraudulent case concerns a California based tech company Tezos, which conducted an ICO in July 2017 and got a staggering $232 million, which later would emerge that it was a fraudulent deal based on a lawsuit filed at a superior court in San Francisco, alleging violation of U.S securities law. In such a case, Google and other social media players who are more involved in advertisement of such nature have seen the need of regulating the advert content. This is amid a growing concern of the investor protection following a huge amount of losses due to reluctance in streamlining the advertising sector, as well as that of the digital currencies. For the brokers, the best time to make a difference is now. All is not lost. In fact, this is the time for those who offer genuine adverts to take the advantage and get certification as the unscrupulous brokers get scared. For the genuine brokers, this is the time for the right push for their products. As the Google positions itself as an open and genuine platform, the brokers have the opportunity to associate with these attributes now and in the future to gain investor confidence. On the other hand, as the market penetration will now become difficult, brokers can explore other options such as optimization of the Google search ranking, operating genuine websites and performing offline marketing. On the same note, trading companies can increase their social media presence, as well as increase traditional advertising such as below the line marketing and Radio or TV advertisements. This will ensure that even when they face the ban effects over the Google AdWords, their presence is still felt on the other platforms, and they are able to maintain their clientele informed. On the investor side, the Google ban means more than ‘just a ban’. This will increase client confidence and user experience which is good for the company also. The users will feel safe and valued and therefore, giving them the confidence to transact over the platform. The ban is also a sort of assurance that the adverts which appear on the AdWords are genuine and have been verified by Google, creating a responsible environment where users can feel secure with whoever they will be dealing with. Investors are always concerned about how secure their payment will be and therefore, having a notion that the existing brokers are certified and the adverts thus are genuine, this in turn provides confidence in the choice of investment. The move will also ensure that fraudulent cases are reduced and in cases where they appear, Google is aware of how to hold accountable as it will have already verified the user and known them more. Without consumers, organizations can barely survive and thus the need to be more vigilant in protecting them whenever possible. The move by Google can be termed as a broad move for the interest of its users and to avert future troubles of being held accountable for the damages or losses which may emanate from a non-regulated advert sector. This move has also seen other big players extend the same measures, and sooner or later, it’s the hope of many investors that they will operate in a world where deceiving adverts will be a thing of the past and where brokers will be responsible. This reality is not way too far considering the measures being taken presently to attain a free fair and genuine advertisement world.